Man, red onion is an absolute salad winner – why are you leaving it off your label? 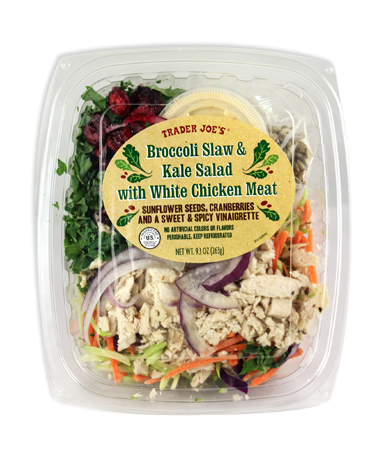 Ah, another delicious salad from Trader Joe’s – but like most TJ’s salads, their Broccoli Slaw and Kale Salad with White Chicken Meat has a unique set of quirks and shortfalls. Somewhere out there is the perfect Trader Joe’s salad, and while I’ve come close before it still eludes me. Nevertheless I press on, searching for that pot of leafy greens at the end of the rainbow. Things get a bit weird from the word go as we face the fact that this is a kale-based salad – an uncommon choice in a world of iceberg and baby spinach. I have been underwhelmed by kale before, but at least now it’s being utilized for it’s intended purpose. Kale is a tough, flavorful leaf – a mess of roughage just waiting to scrub your insides clean, and as such demands a flavorful and carefully balanced composition to justify such a bold base. TJ’s finds exactly this with the addition of such hearty ingredients as cranberries, sunflower seeds, a coarse grating of broccoli slaw white chicken meat and, though it goes unheralded on the label, finely sliced red onion. Thin shavings of red onion are one of my favorite additions to any salad and they do beautifully here, adding a bit of zing to the broad, nutty flavors of the kale and sunflowerseeds. What works a little less well for me is the broccoli slaw. Not that I have anything against broccoli slaw – in fact I buy Trader Joe’s Broccoli Slaw by the bagful for use in my own salads. That, however, is exactly the problem. The broccoli slaw on this salad is indisputable the same kind they’re peddling to me from the produce aisle three feet to my left. While that doesn’t necessarily drive me into a rage or anything, it does make me feel a bit cheap. I suppose it was a little naive of me to think that Trader Joe’s might have a separate storehouse of special ingredients they use to make their salads and that weren’t just dipping into the common trough of their consumer goods and slapping something together. Nevertheless, it’s nice to see someone get dressed up if they’re courting your tastes. If you look at your little pail of food and realize it’s just just a diverted conveyor belt away from whatever goes into the bulk, economy bags the magic fades a little. Aside from that rather abstract gripe, there’s only one other thing that bothers me about this otherwise very fine salad – the salad dressing. The packaging bills it as a “Sweet and Spicy Vinaigrette” which begins to approach the truth of the matter but then explodes in a burst of absurdity. Sweet and spicy? Yes, and very tasty to boot. Vinaigrette? Not on any planet I’m familiar with. The thick dressing that rolls sluggishly about its little plastic tub has more in common with 1000 Island than any vinaigrette I’ve seen in my life. In fact, a quick survey of the ingredients, or a quick taste, reveals that the dressing is primarily made from mayonnaise. Is this bad? Not necessarily, certainly not if you don’t mind a delicious but hugely fatty dressing on your kale. For my part, I substituted in Trader Joe’s Balsamic Vinaigrette and was much happier for it. Would I Recommend It: Yes – even if you’ve never liked kale before you might like this. Would I Buy It Again: Despite a couple short-comings, absolutely. Final Synopsis: A robust, healthy salad with an unhealthy dressing. I’d love to know the ingredients in the dressing. This is my fave salad! I just found this salad and love it. I remove the red onions (I love them they just do not love me). As for the dressing, it is very heavy on fat and salt (not unexpected), so I only use 1/3 of the container but it is good. I hope TJ’s keeps it as a standard salad. I couldn’t agree more – this is a killer salad! I too really enjoy this salad.I hope Trader Joe’s sells the dressing as it is wonderful.Now, I’m hungry for that salad and I live 40 minutes away. I love this salad and I’m not big on salads but I’ve had it so many times, but I’ll will agree the dressing is too much I only mix in just a little bit. 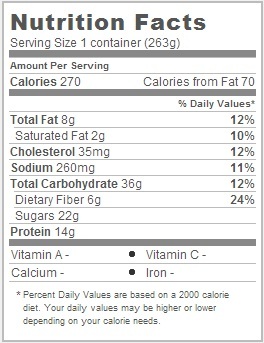 Do you really eat only half of the container? They went and ruined this salad! New container, new arrangement of contents, no red onion, different consistency of dressing. Is this what happens when they have a new source for the product? Terrible.